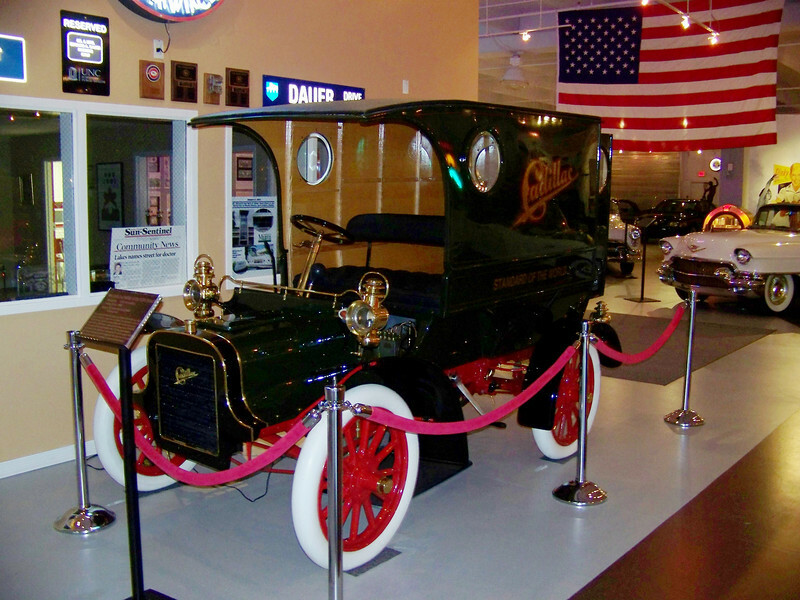 The Dauer Museum of Classic Cars is a private facility located in Sunrise, Florida. The Florida Avanti Owners Club was able to tour the facility on April 18, 2009. The museum is exceptional set in a theme setting. A special thanks to our hosts Larry and Chris. It was especially nice talking a Chris a true car enthusiast. We are able to visit the Dauer Museum a second time on June 23, 20012 along with some friends. Thanks Chris! Three years after the first Cadillac was offered to the public as a single model, this delivery wagon was introduced. The horizontal single cylinder "Little Hercules" engine is mounted under the front seat and uses an updraft mixer (carburetor) to develop it's ten horsepower at 900 RPM. The engine must be hand cranked to start. The two speed planetary transmission's low speed band is operated by the left foot pedal, while the high speed and reverse bands are engaged by the large lever on the right hand side of the vehicle. The steering is a rack-and-pinion design.